The deal: A new $21 lunch menu, available at the bar, includes a choice of burger, one side (duck fat fries, greens or onion rings), a non-alcoholic drink and a brownie. The deets: Michael Mina’s Georgetown restaurant is offering the special lunch menu exclusively at the bar, Monday through Friday from 11:30 a.m. to 2:30 p.m. 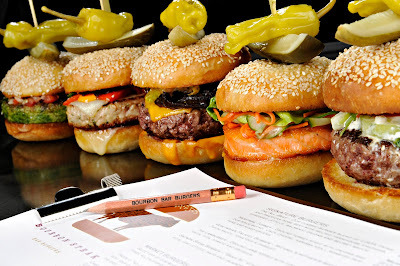 The five burger choices from executive chef David Varley’s menu include an oak-fired prime dry-aged steak burger with housemade pickles, Cabot clothbound cheddar and a secret sauce; a glazed salmon burger, made bahn mi style with garden cilantro, jalapenos and shredded carrots; and a vegetarian falafel burger with tahini, tomatoes and parsley. Later cornstarch is mixed into cold orange juice. Orange juice is added to pan juices and stirred over medium heat until thickened. Just before serving the heavy cream is added to the sauce and stirred well into the juices in the pan.